Wider skis for my wife? Lately I've been contemplating getting some new wider skis for my wife. As we spend more and more time out west every winter, the appeal of a wider ski is certainly getting stronger. Her present "wide" ski is the Dynastar Exclusive Legend Powder, which is 121/85/104 at 165 length, 19 m radius, no rocker. Before we get into ski choices, the most fundamental question is: "Does she really need a wider ski?" The skier: 130 lbs; 5'7"; strong, powerful technique, but......she is missing the ACL on her left knee, which definitely influences the ski choice and width (see older thread re. ski width and knee pain). Basically, the way I see it, she needs a ski that is both very capable off-piste, but can still hold an edge and not flap at high speeds on hard snow. Versatility is paramount. In other words, a soft-snow-only ski won't do it. Her present skis have been serving this need rather well -- they are light, agile, responsive, excellent in both soft and hard snow, stable, damp, powerful but not overly stiff. Outstanding all-rounders. Their sidecut and flex pattern give them pretty decent float in most conditions she has encountered to date. But.....I'm just not sure they have enough width for float if she wants to get into the deeper stuff. So.....knowing all that, given her weight and height, does she need a ski wider and/or longer than 85mm / 165 cm? I've been chatting with a couple of pals about this, and getting some good opinions on both sides of the argument, both pro- and contra-. But, I thought it would be fun to toss the question to the gang here, and see what comes back. Re: Wider skis for my wife? Svend: How would you describe her skiing style. I know she plays hockey and skates and skis well and I remember you've joked about her "need for speed". What skis does she like and use in addition to the Dynastars? Also, wide skis don't bother the knees much when they are on soft surface (groomed or powder) and you are blanced on them; but I agree with Bushwacka's comment about the difference between 90 and 100 when you are on a hard surface and they are levered up on edge? Will you be schlepping a second pair of skis for her for those conditions, or is this more of a do-much western ski? For comparison, her hard snow skis are '07 Head Supershape Speed (163) as her groomer thoroughbreds, and '09 Fischer Progressor 8 (160) as her lighter more agile choice for easygoing days (skiing with our nephew, slower friends). As for carrying two pairs out west....hmmm....I guess is depends on where we are going. Lake Louise can get pretty icy at times, so with no fresh snow there, a good narrow ski with aggressive edge grip would definitely be in the luggage. But for places like Utah, Jackson Hole, BC interior, I would say that she would carry only the one pair. Therefore, as mentioned, versatility is going to be pretty important -- the skis must have good hard snow performance. does she need wider skis - simple answer is no. Jim IMO the jump is from about 105mm on hard surfaces, IE alot of skis over 105mm hurt my knees on harder snow. some people limits are lower I am sure, and some are higher. It also has to do with foot width and how much people can generate angle. nomad SFTs for instance never hurt my knees, but the Cochise had my knees screaming, and I bet that had alot to do with the fact the Cochise were a much better carver and I could get higher edge angles on it. None of the 100mm and below skis have never hurt my knees, since most peoples foot are around 98mm wide it makes sense alot of people rave about how versatile the 98mm/100mm skis out are. demo some skis and find out. are all more playful side of things has flex very much like the dynstar she is on. all will be fine on groomers really. In fact I think some are actually better on groomers than the exclusive powder. Hey Josh -- could you expand a bit on that answer? Do you mean "No" because they have enough float in deep snow at 85mm / 165 cm for a 5'7" 130 lb skier? You're probably right about other skis being better on hardpack than her Dynastar Powder. She demoed the Dynastar Paradise/Slicer last year at Jackson and really liked it. The full sidewall gave pretty darn good edge grip. Having said that, her present Dynastars are quite good too, as I keep them sharp and with grippy edge bevels. FWIW, she has not demoed any other skis in the 95 - 100 range. the deal is in most cases more float is a good thing. At her weight she has the advantage of getting 130mm of float out of a 98mm skis which means that her powder skis can be alot more versatile than a guys powder skis. the only reasons to run a narrow waist is to have better edge grip, to be quick edge to edge, and to not hurt people's knees. I do not know a single person who has ever been on fatter ski in 3d snow and was thinking man I need less float. At her weight she has the advantage of getting 130mm of float out of a 98mm skis which means that her powder skis can be a lot more versatile than a guy's powder skis. Interesting point, which made me remember the online ski surface area calculator (http://freshiez.net/skiarea.html). According to that, comparing kg/cm2 for myself and my wife, I get a surprising result: even if I chose a 120 mm ski at 192 cm long, at my body weight (220lbs) I still would create more kilograms per square centimeter than my wife does on her 85 mm ski at 165 cm. Now, I'm not sure that such theory translates into equivalent performance on snow, but it sure is illuminating. And this not a question of need, but rather how much is enough? If the current skis will work even in deep snow, even according to the consensus opinion here on the forum, from those who've skied way more deep snow than we have, then I'd rather use the money to update her groomer skis, or buy her a plane ticket west. If, on the other hand, the 85 mm width will limit her terrain choices and restrict where she can go, then I'd happily buy her a wider pair. She doenst "NEED" them, and the only argument I am going to make against math is that math doesnt tell the whole story and like I said enough is never enough. My favorite powder skis have 2615 sq/c and I weigh 165lb, and could easily see how a 3000 sq/c ski would ski powder better. More Platform = more dynamic turns. I don't agree that it's that simple. If it were true that wider always equals better, then we would all be on 140 mm skis, 2 meters long....water skis, basically. You're neglecting to mention the trade-offs for going wider -- heavier skis (wider/longer = more material = more weight), slower edge-to-edge, less agility, more knee strain, poorer hard snow performance, etc.. But I do agree that math may not tell the whole story, and that's the reason for posting my thread, is to get some insightful and well-reasoned opinions on this. Basically, we're trying to find a balance between soft snow float (ie. how much width/length is needed) and hard snow performance (lateral and torsional stiffness; sidecut). We're not talking heli skiing in BC or Alaska here. 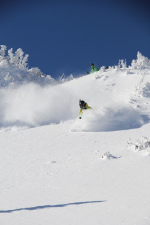 We're talking inbounds bowls, trees, chutes, and groomed runs in western resorts. Furthermore, we haven't even touched on some of the other variables that affect how a ski performs in soft snow, such as sidecut (how much? where should it start relative to the tip? ), stiffness and tendency to trench vs. float, rocker (how much? tip and tail? ), flex pattern, etc..
Like I said, this all about balance of ability and versatility, so I'm asking for input from others who may know more than I. Josh, you're clearly in a different situation than the rest of us when it comes to ski choice. You mentioned in another thread that you were sponsored by Blizzard (I think I'm correct on this), so I imagine that you are in the enviable position of having armloads of skis thrust upon you and can therefore pick and choose whatever your whim desires. But that's not our reality -- with 8 pairs of skis in our family, we have enough already. We have to be choosy and selective and make well-informed decisions, so our family quiver stays within sensible numbers. Svend: I think you missed Bushwacka's main point. Your initial post asked "does my wife NEED (my capitals) new skis? He was just keying on the word "need" and saying that none of us "need" new skis -- in fact we don't really NEED to ski. Just like my new road bike, I didn't NEED it in any rational sense, but I chose to get it anyway. I agree with several points. 1. 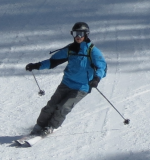 For people in Josh's skiing group, I can believe that they see no limit to the width or amount of float they could use. However, I doubt that even they take out their widest board every time they go skiing, and he has identified his personal trade-offs in different ski length and width for different locations and types of skiing. Same process you are looking at, but different. Interestingly, I don't see snowboards getting wider than they were 5 years ago?? So maybe there is some limit to the amount of float that is necessary or acceptable to whatever the trade-offs might be. 2. I remember PhysicsMan on Epic having the same level of numbers as far as surface area of skis and how much less width lighter women needed than guys. But I also believe that surface area doesn't tell the whole story. The Spatula with its really wide waist probably had a greater feel of float than a "classical" ski with the same surface area but with a narrower waist, plus all of the other ski characteristics that y'all mentioned. 3. I think BW's comments about ski width compared to boot last width is VERY interesting. I had not thought about that. 4. There is a lot to be said for "confidence in one's equipment." (right guys?) Your wife might very well grow more because she has confidence in her current skis than with new skis that she doesn't know as well. 5. I would say "demo some skis in the 95-100 width" in a variety of conditions, and make a decision if she finds one that she really likes. If she doesn't, then the skis she has are pretty good, will grow with her, and won't require a narrower second ski as much? 6. And remember that, in general, wives aren't as much gear whores as we are. It's almost discouraging sometimes that Lynn can easily lust over shoes or jackets, but not so easily with skis!! PS. And if you get a chance, have her ski a SkiLogik TwinTip ISIS (131-92-117 15m), Goddess (140-101-126 15m), or Icelantic Oracle (138-100-122 16m) as contrast with more powder oriented skis with less sidecut. Point taken, but let's not get overly focused on the word "need" in this discussion. We all know that it is frequently used rather loosely, and not necessarily meant to be taken in a rigid literal sense. Gee, and here I thought I was being too verbose, writing reams of text to make myself understood. It seems I will have to be much more succinct in my choice of words here, lest someone misinterprets my meaning. Funny thing, that. Some people can barely string a coherent sentence together, and others get strung up with a single word. So, for the sake of clarity, let me then reword my original question: "Would she benefit significantly from a wider ski, or are the trade-offs and drawbacks not worth the extra floatation?" Hope that works for everyone. 1) That is understood. But my wife does not ski the same terrain as Josh does, nor has the same skiing style, etc.. I thought I was fairly clear on that. This is not a discussion of what someone else thinks is best for my wife, because that's what's best for themselves. The request for advice was qualified with plenty of context for where she will ski, technique and style, weight, etc., and feedback would be most helpful if that were kept in mind (we've been through this issue many times on this forum). 2) Agreed -- see my previous post re. other variables. We can discuss those later; I'm first trying to determine some fundamentals, ie. ski width; then we can move on to the finer details. 3) Agreed, it is interesting, and worthy of further discussion, but not sure how relevant wrt. to this chat about float and ski width. 4) True, but she is a good skier, and shouldn't take her too long to get the hang of a pair of new skis, or even a demo pair for that matter. 5) She will do so. I should have mentioned that. She will be in Jackson Hole in January, Banff in March, and there are lots of great skis available for demo, which she plans to tap into for at least a day at both places. BTW, the base lodge at Jackson has Ski Logic for demo -- sweet! Will check if they have the ones you mentioned. 6) Totally agree! The seeming disinterest in the gear is simply shocking I mean, in this sport, the gear is EVERYTHING....isn't it? armloads of skis to test maybe. A pair a year for nothing. I am not Arne Backstrom. Last year I really only skied on 3 skis all winter. Mag 8.7 for hard snow, "the one" for everyday, Katanas for powder. The Bushwackers I got last year effectively replaced the 8.7 for all but the hardest snow, and my Bonafide's this year will replace "the one" that are now a rock skis. For my powder skis I will most likely go to another company because Blizzard doesnt make a great east coast powder ski yet. I generally have a 3 ski quiver and the middle ski can pretty much handle it all. 2. I do not like the calculators and how people use them. Like I said there is no such thing as too much float for anyone. Go as wide as your legs can take/still edge grip on the hardest snow you will see. For most people this 100mm wide. 3. it relevant only that most people can get on a 98mm skis and just go, there is no real learning curve. You are correct, you pretty fully explained what you were looking for. In the skis that I suggested, obviously I like my Ullr's Chariots (equivalent dimensions to the Goddess). Lynn demoed the Isis/Rave and it took her about 200 yards to decide she REALLY liked them (and she wasn't/isn't looking for new wide skis). Most of the rest of the demo time was just her convincing herself that her first impression really was accurate. I also think that even in soft snow there are some advantages to skis with more sidecut. Example. Comparing her Dynastar with the Isis. Waist = 85 vs 92. Tip = 121 vs 131. Tail 104 vs 117. Not that much extra waist width, but a lot more surface area tip and tail. And, I think, the wider tip really helps float keep the tip of the ski up. I know nothing about the Icelantic except it is female specific and in between the Nomad and the Pilgrim (two pretty good skis). (And, if you have a Ski Logik demo location, then you need to give me your thoughts on an Ullr's Chariot as well -- in both TwinTip and Rocker Logik if you please). 1. your right most have some really big skis, even at stowe some people I ski with have 130-150mm underfoot monsters that would make no sense unless you were us. With that said I would say our 100mm skis our the ones that come out to play most often. For me I feel I can ski better than 95 percent of people on piste on them, and puts me in the 1 percent category off trail. The 100 mm waist width many of which our actually 98mm is by far the most versatile skis you can buy. With sharp edges on 98mm skis I never have an issue getting an edge on any surface. Good, and what I expected. But you can then apply the "calculator" information to determine that his wife could get more float out of 85-95 waist widths than you and your friends get from 100mm waists. (all other factors being equal). And I use that to support my contention that she's fine with the skis she has, unless she demos something in the 95-100 range that she falls in love with. And I agree with what you said, I don't think she should go above 100. Gary, what does Alice use for her powder ski? Lynn's are 84mm Fischer Muanga's. That's what I'm looking for! Something tangible to sink my teeth into. I think Alice's skis are 99mm, but what I don't know is whether they are working for her. I'm sure that at 120 lbs, they are plenty wide to get her up on the snow. But what about hard snow performance? Knee strain? Maneuverability and quickness? Lightness? Edge changes?